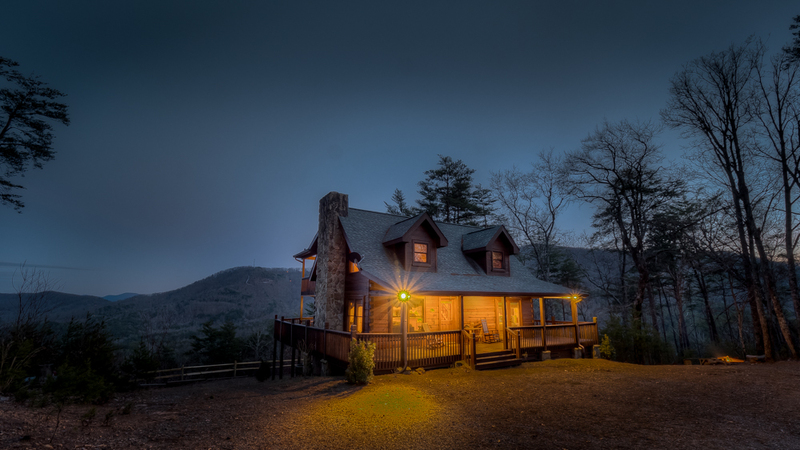 The Overlook cabin is a place in a storybook setting where stories are also in fact, created. 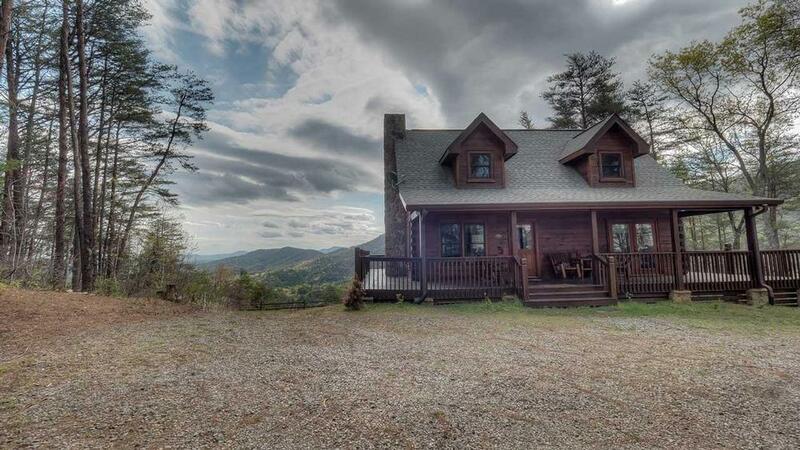 By far, this property is in one of the most private settings in the North Georgia Mountains. You’ll travel along a sharply winding, steep gravel road that will rekindle imaginings from childhood fables which took place in secret woods. 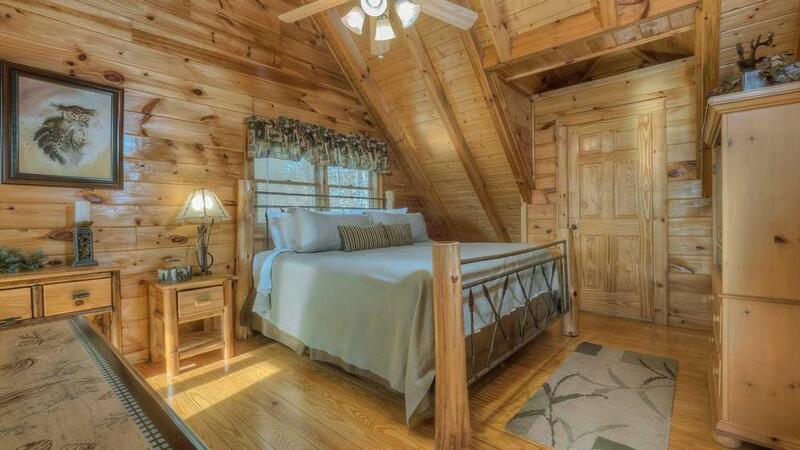 However, this road is easily mastered and your reward rests in the charm and beauty of The Overlook cabin. 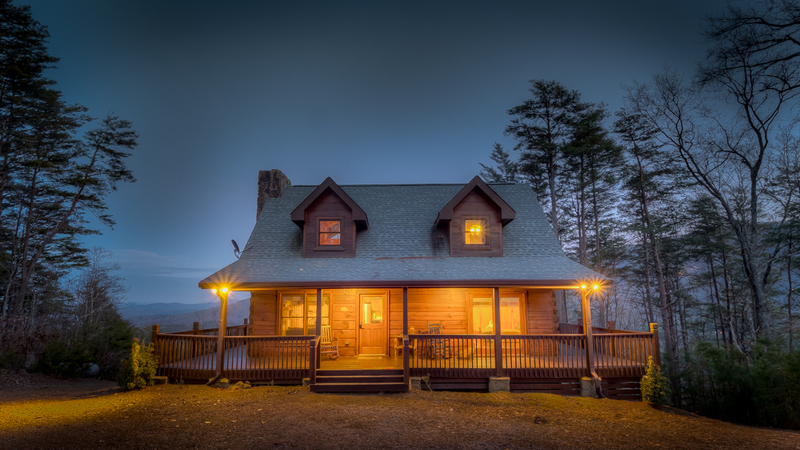 Perched high above the Aska Adventure area, this home has panoramic mountain and distant lake views. 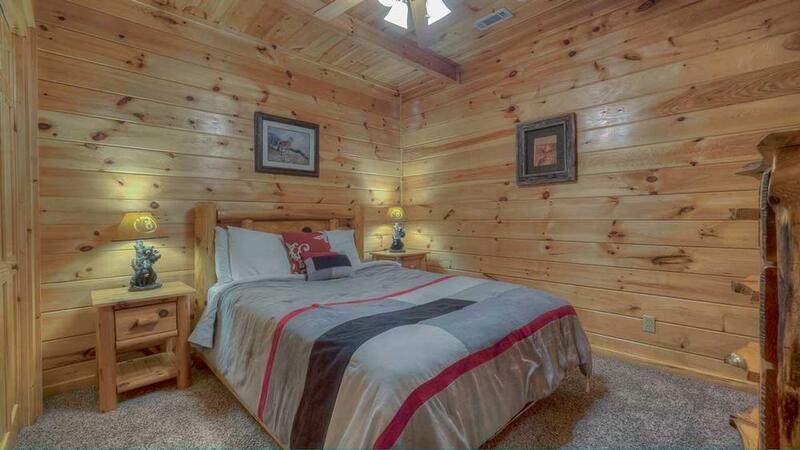 It sits in total seclusion, yet is only 10 minutes from town and walking distance to the Benton McKaye trail. The Overlook is full of character with a warm and welcoming front porch, side stone chimney and adorable second floor dormers. 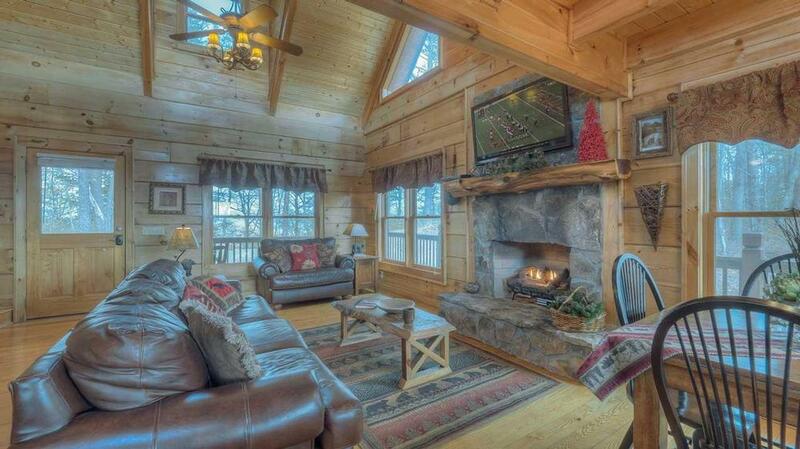 Inside, the living area features an open floor plan with gas log rock fireplace and rich leather furniture. There is a wraparound deck with plenty of seating inviting you to the outdoors. A particularly happy spot in the home is the loft that overlooks the great room on one side, and has its own deck with rocking chairs on the other. Here you can relax outside as well or have fun at the loft’s air hockey or card game table. Back downstairs, on the terrace level, the game room is replete with a billiards table and a wet bar. A four-person hot tub and a personal sauna allow perfectly pampered treatments as if in your own private spa. Lovely bathrooms continue the serene spa feel and are conveniently located – the lower level one is even wheelchair accessible. Three bedrooms, one on each floor, offer a king and two queen beds; all outfitted in high thread linens and plush comforters. When it’s time to retire, crack open the beautiful bedroom windows to hear the soft distant sounds of nature from your perfectly secluded spot within it. Breathing in the cool mountain air, the Sandman begins to take over. As you recount the day’s lovely story, a smile draws sleepily across your face in gratitude for this perfectly happy ending. 03/19 - The view was awesome! Fully equipped, everything you need for a stay. Any interactions with this company have been really nice and helpful. 01/19 - Great view, space around outside of home was nice to walk, wrap around porch nice feature. Enjoyed staying in the home. 12/18 - Great location, beautiful view. Great communication. 09/18 - The view is breathtaking. The company is very easy to rent from and the staff are very friendly and helpful. 09/18 - We really enjoyed the cabin and the fact it was so secluded. Make sure you have 4 wheel drive to get there. The company is easy to work with and offers a discount for returning guests. 07/18 - Easy to rent and get situated when arriving. Very professional, high attention to details. 07/18 - GORGEOUS view. Spacious home. We did a lot of cooking and every utensil we needed was there. Hot tub was amazing! I'm thoroughly impressed that you offer such beautiful accommodations at such reasonable rates. Thoroughly grateful. 06/18 - I liked the proximity to town and the long-range mountain views. Furnishings were comfortable. Sauna was a nice bonus. Kitchen was well equipped with knives, pots & pans. I especially liked that the grill had a dedicated gas line! Excellent. 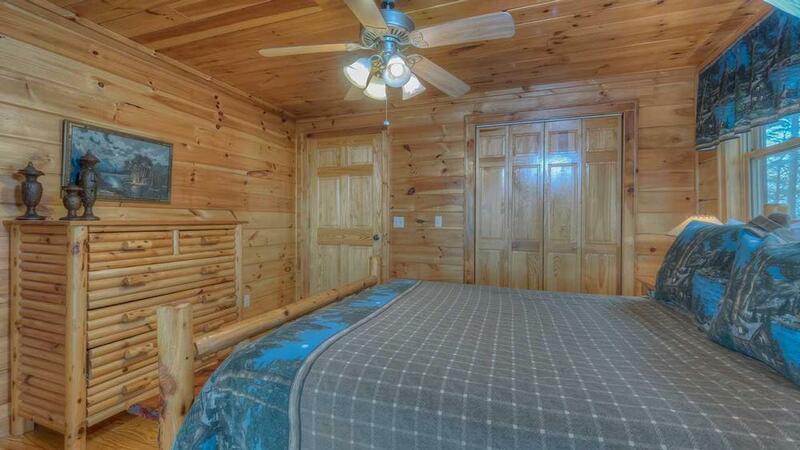 I've rented cabins from you for a number of years and have never been disappointed. 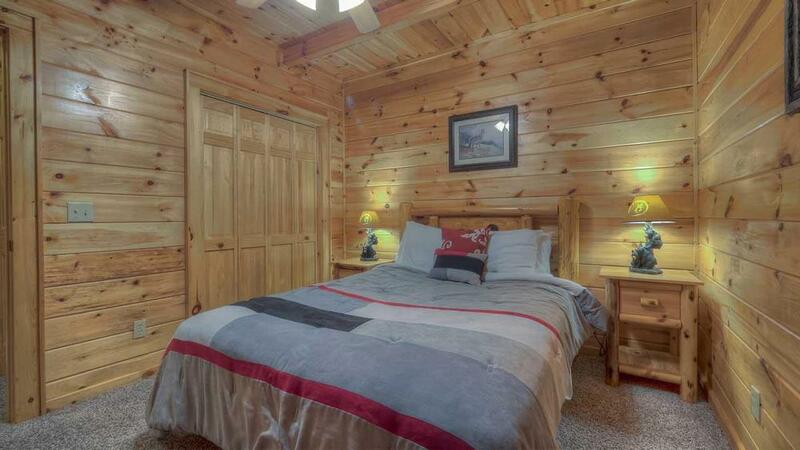 Good job keeping up the quality of the cabins, the customer service, and the service. 06/18 - The view was awesome. We enjoyed it all. I always enjoy Blue Ridge. Made reservations at the last minute and was accommodated. 09/17- We enjoyed the beauty and peaceful surroundings. I think your company was very responsive and accommodating and responded promptly. 08/17- It was very clean, absolutely beautiful! The best part to us was the sunrise. Sitting in a hot tub watching the sunrise, I can't even put into words. Very easy and informative. 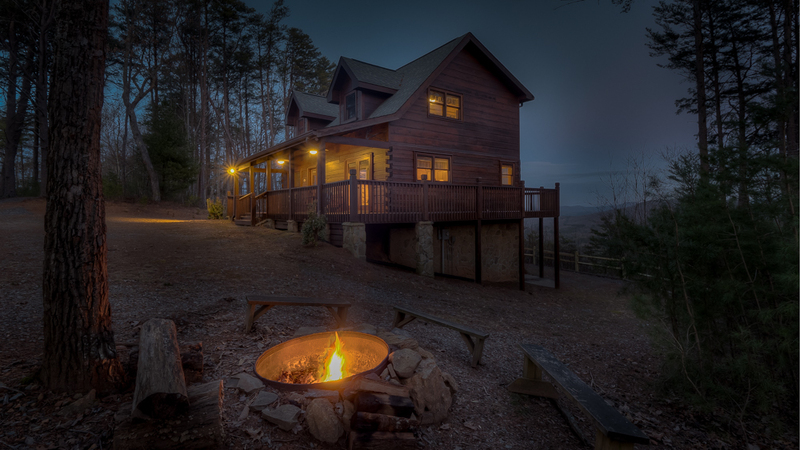 07/17- We enjoyed the views, hot tub, space, rocking chairs, fire pit, and the tranquility. 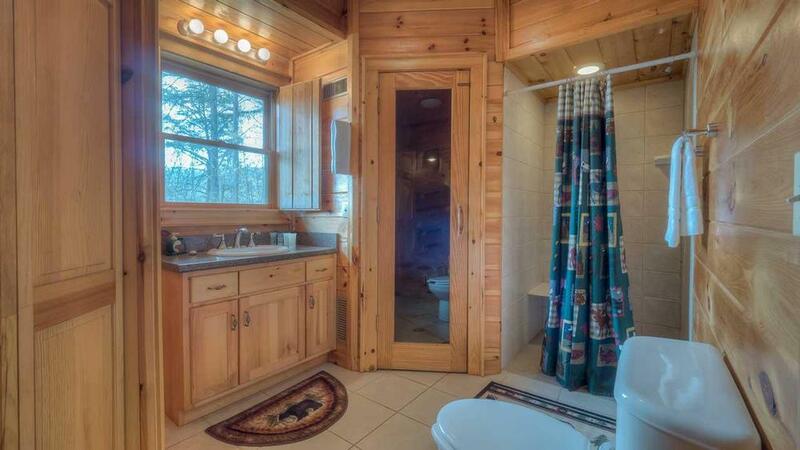 I did my research on the company and the log houses and decided to rent a log cabin for my husbands birthday, so that says a lot. 06/17- It was a wonderful place, the perfect getaway. The company is very well organized and the staff are friendly. 06/17- The view was spectacular. 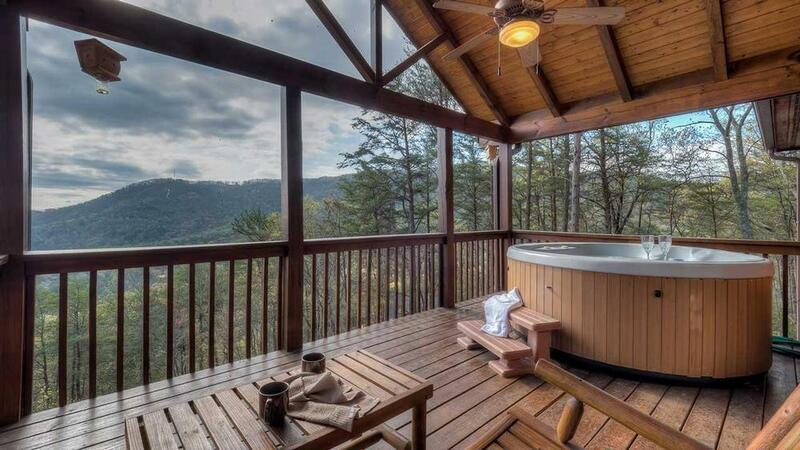 The hot tub is a definite plus. 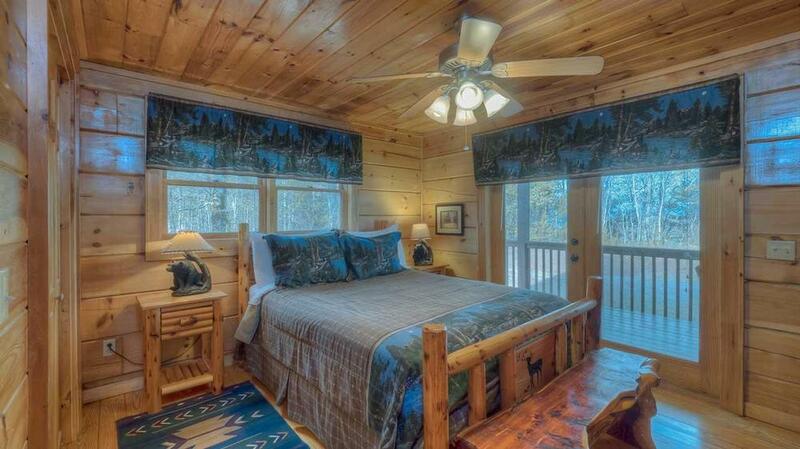 The layout of the cabin accommodated six adults comfortably. We enjoyed making SMORES in the fire pit. The number of rocking chairs meant that we could all sit and enjoy the peaceful view on the back porch. The linens and towels were very clean and made it pleasant to shower and sleep. The washer and dryer were wonderful additions. Each step of the rental process was easy and convenient. Everyone I spoke with was friendly and helpful. 05/17- Very well maintained beautiful cottage, great location, wonderful view and great amenities only make sure your car is all wheel drive. The last one mile is slightly scary, when you walk on the road it's quite spacious but when you drive first time it's a little scary but the cabin is beautiful. 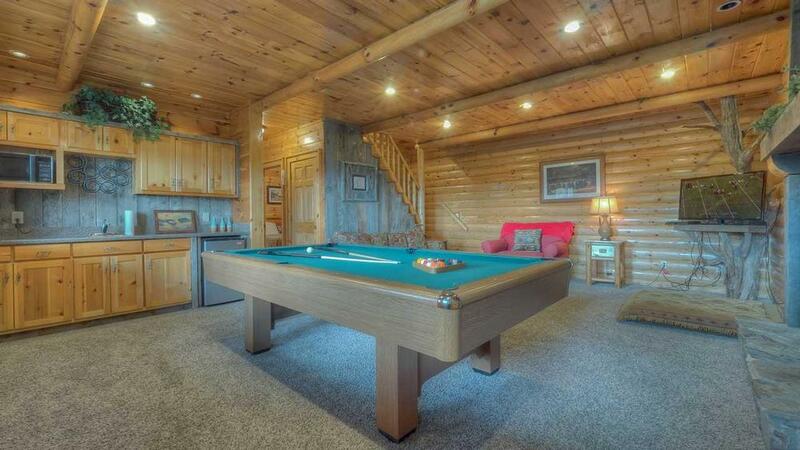 03/17- We loved the seclusion, the cabin looked like the picture representation and we enjoyed the pool table. For our first interaction with the company, I think it was very good. Would definitely do this again. 02/17- There are not enough words to describe how much we've enjoyed our stay. It was simply amazing. We enjoyed everything about this beautiful home. Thank you again. 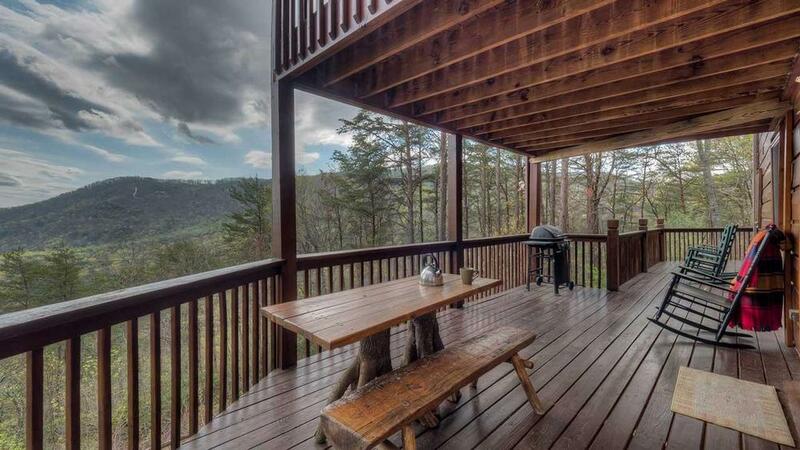 11/16- The Overlook cabin was just simply phenomenal with it's breathtaking views, hot tub, and having everything you can want or need in the mountains. Pictures really do not do it justice. We will definitely be back. 11/16- Great company. I am a repeat customer and we are already planning our next trip. 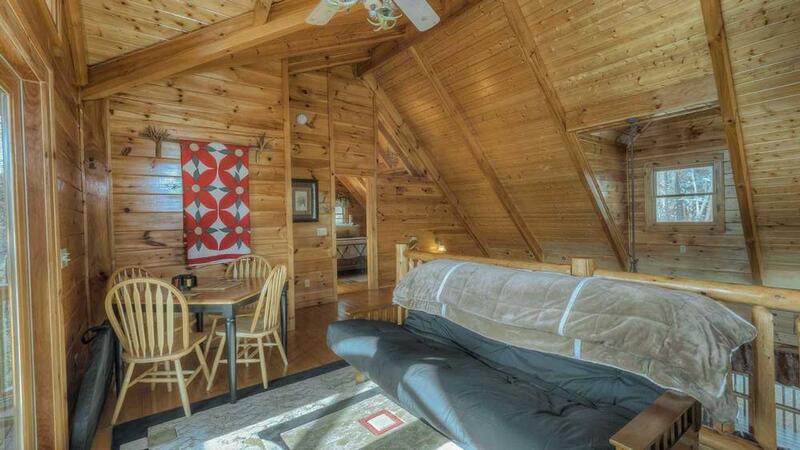 09/16- Enjoyed the location, size of the cabin, amenities, quaintness. I am very impressed & look forward to working with you again soon. 08/16- Stunning view! 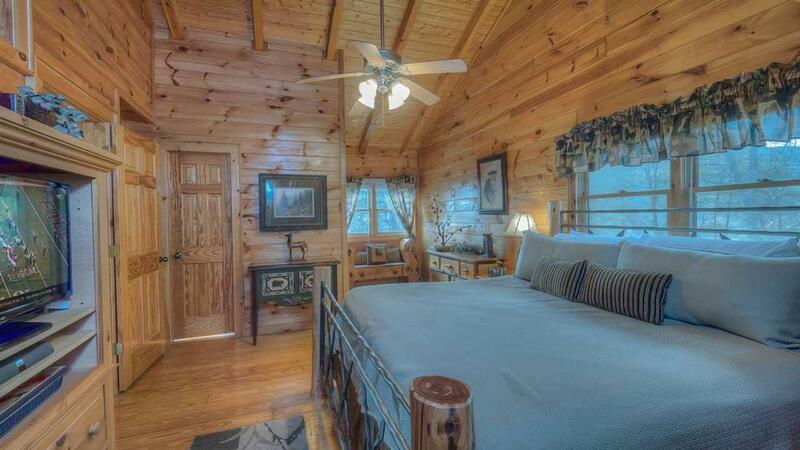 Beautiful design inside home gives it a real mountain cabin feel, which is exactly what we were looking for. 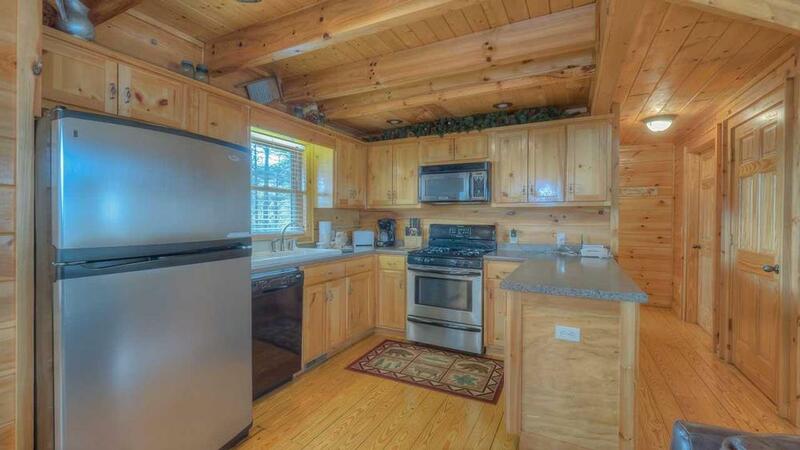 Love the 3BR/3BA layout with each living space having its only floor. Love the remoteness and tranquility of the environment! As far as a company to work with, high quality service. Top notch. 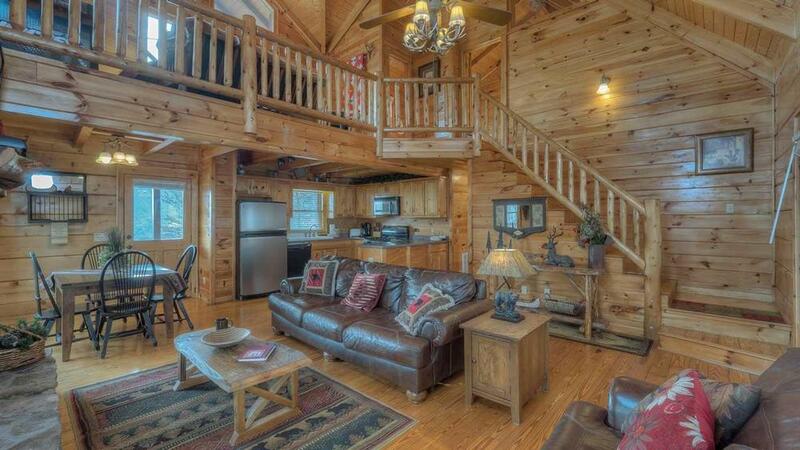 Resort luxuries inside a private cabin. Will do business with them again! 08/16- the view was great. It was a beautiful cabin. loved the sauna. 07/16- Close to town but at top of the mountain. Being able to watch sun rise on rear porch and sun set on front porch. 06/16- The Overlook was absolutely beautiful and very clean. The instructions (everything from the WiFi directions to the checkout procedures) were clear and easy to follow. 06/16- The view. After the short rain we had, i went outside and the steam coming off the trees and a rainbow behind it. Marvelous. The kids loved the pool table, hot tub, and the air hockey. Smores in the firepit. A great getaway from the hussle of everyday life and enjoy life. From the reservations until we left. Everyone was awsome. We will be using your company again. 03/16- Remote location. Sauna was very nice. The mountain view was nice. I love the company and this is our second rental with more to come in the future. 11/15- Beautiful view--very clean and comfortable. From reserving the cabin to answering any questions we had, the staff did a great job. When initially driving to the cabin, we were concerned that we were lost and so we called the office and they had Lisa call us back. She stayed with us on the phone until we got there. We really appreciated that!! 10/15- We really enjoyed The Overlook. 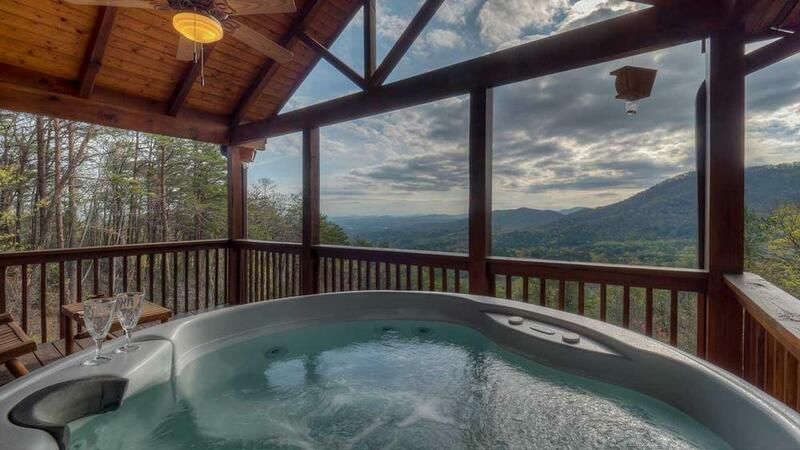 The views are amazing and the home is really nice. I hope we can stay there again. 09/15- The View is very nice! Location is difficult to reach but once you are there, you appreciate it. 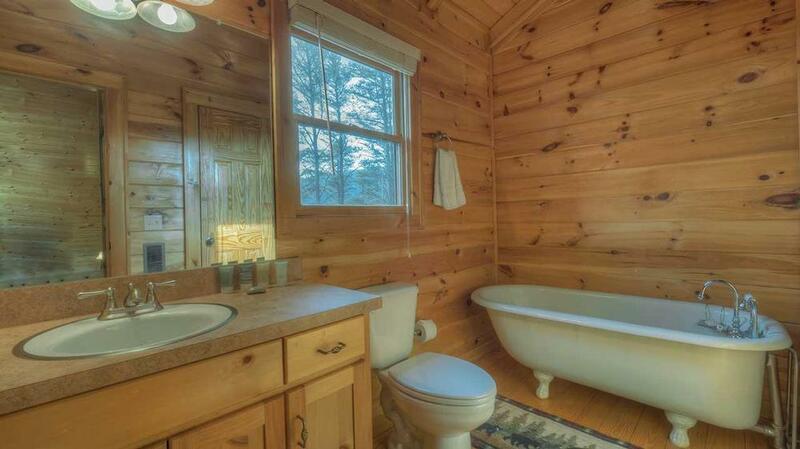 09/15- Overall privacy of the cabin and the indoor cleanliness was immaculate. 08/15- The cabin was beautiful and spacious and the views amazing. Very quiet, very clean and a real escape from modern life. Very responsive company with great customer service and full disclosure of costs and special considerations. 07/15- Location was the best. Size and layout of the cabin was also really good. So far all of my interactions have been great. I will also add that when I first called to rent a cabin. Jennie (not sure of spelling) was super helpful in finding me the right cabin for our needs. 06/15- The view was the best! 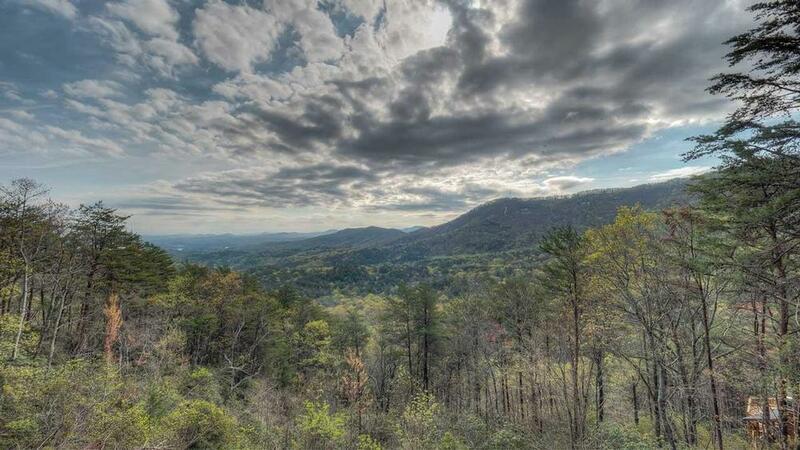 05/15- The long range views, the beautiful design of the home with wraparound porch and loft area. 04/15- It was very nice to have 3 decks. The view was awesome. It was perfect! 02/15- WE LOVED THE LOCATION!! Although there is another house very close, there was no one staying there while we were there, so we felt secluded. Never saw a car or another person the entire time there. Loved the view. We Went to the cabin and never left til checkout. Enjoyed the fireplaces and pool table! Roadway was easily maneuvered with 4x4, even with snow on it. We've always received great customer service from the folks at EBR. We love the convenience of the check in/check out procedures. 01/15- View is great, cabin is nice. 12/14- The amazing mountain view was the #1 reason we chose this cabin and it certainly did not disappoint. 10/14- The view is incredible despite the drive up. I will say once we got use to it, it was part of the adventure. 09/14- view and comfort were our favorites but difficult to get to. 08/14- We loved the cozyness throughout. If you own a 4WD this is a good place. The road is steep, gravel and dirt with bumps, sharp turns and precipices. Hope you don\'t meet another vehicle. We got stuck and had to back up and get a run at it. When we finally made it up, we enjoyed the place a lot. 12/18 - The view was amazing! Loved the wrap around porch. The fire pit was nice as well as the basement with pool table and air hockey in the loft. The hot tub on the third floor deck at night looking at all the stars was awesome! We spent a week in the Overlook for our honeymoon and had an amazing time! The views were gorgeous and the hiking was beautiful. 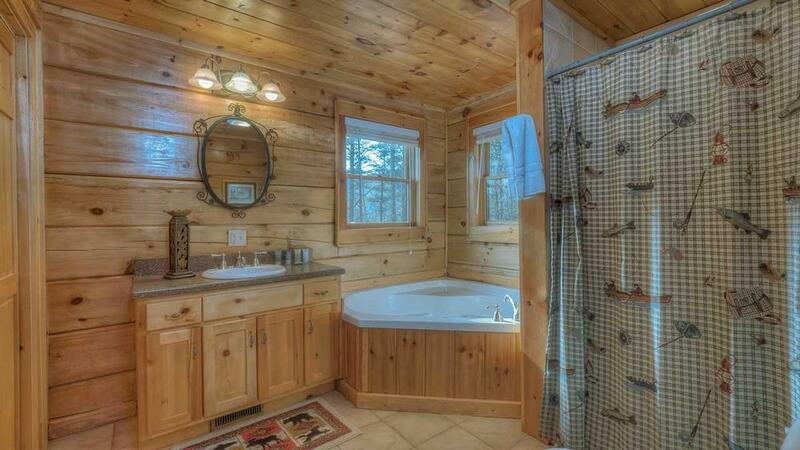 We loved the hot tub and the comfy feel of the cabin. The only drawback is that another house is being built right next to this one. Though it would have been perfect seclusion before, that has changed with construction. Updating the cabin's description would be a good idea, so it's not a surprise. Other than that, had a great time and would love to come back to Blue Ridge!